Recently I wrote about how deeply concerned I am with the American public’s seeming apathy about the government spying on its own people. I received a lot of positive feedback, and I was excited that so many people still feel the importance of standing up for freedom. I got one email from a gentleman who seemed to feel that I had overstated the concern. According to this man, many Europeans benefit from government health care, education, protection and other benefits — and as a result, as he sees it, they are just as free as Americans and in fact happier than most Americans as well. He specifically suggested that socialism is really a pretty good thing. I appreciate this man sharing his view, and I am so glad we have the freedom to openly share differing perspectives. That said, I could not disagree with him more. The kind of freedom he suggested is freedom from responsibility, the kind of freedom children enjoy. Children are often “happier” than their parents, because the parents take care of the adult responsibilities while the kids blissfully enjoy the protections and benefits they receive through no effort of their own. But let’s be clear: the children’s freedoms are entirely dependent on the whims of their parents. Eventually, adults must stand up for their own freedoms or they are little better than slaves. They may be well cared for, but their freedom is only as reliable as the whims of the elites who run their society. Freedom and happiness only last if the people take responsibility and stand up for their own freedoms. In fact, despite this man’s view of European socialism as an improvement on today’s America, the truth is that some of the most vocal criticisms of Washington’s spying is coming directly from Europe. They are especially upset that the U.S. government is spying on them as well as its own people. Both of these men are right. I wish more Americans saw this as clearly as they do. If the man who emailed me is right, then many Europeans are thrilled with their socialist “freedoms.” But even they are appalled with the scope of the American government’s spying agenda. (Actually, during the two years I lived in Europe, the number one comment I heard from people when I told them I was an American was something frustrated about their own government. Most of them told me they didn’t like America, but they liked their own government even less. I had literally dozens of these kinds of conversations. Another European leader worried that “this speaks poorly of checks and balances in the” American system. The irony here is amazing. Europeans are angry at America’s spying apparatus, while a majority of Americans don’t seem to care that their own government is spying on them. All nations spy on each other, the Times article noted, but the scale of the U.S. operation dwarfs all the others. In reality, the European response is predictable — it’s an opportunity to criticize Washington, even though most European governments are doing the same thing. But there is a bigger issue in all this. For the most part, the American people are simply moving on with their days as if there whole way of life isn’t at risk. Isn’t it about time more Americans responded with the same passion as these European leaders? Or in the way of the American founders? Or any other people in history who won or maintained their freedoms? People who won’t stand up for freedom can’t keep it — and don’t deserve to. At least the man who emailed me stands for what he believes; he genuinely likes socialism, so he’s glad to see America socialize. I think he’s dead wrong, but his view isn’t the real problem. 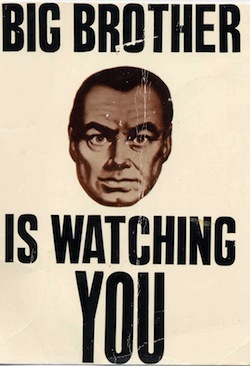 The real problem is much bigger: The government’s spying agenda really is Orwellian, and there are millions of Americans who realize this and also deeply care about freedom, but simply do…nothing.